It was a night of African music as the One Africa Music Festival went down at the Madinat Jumeirah Al Sufough, Dubai. With performances from 2Baba, Tekno, Emma Nyra, Davido, Tiwa Savage, Wizkid, Flavour, Banky W, Vanessa Mdee, Victoria Kimani, and much more, it was quite a thrilling affair for lovers of African music. 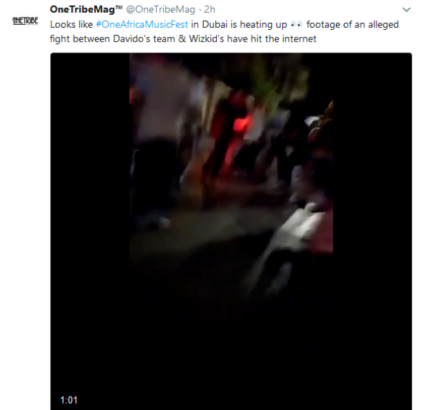 Now Here’s the thing, there are reports from Dubai that Wizkid and Davido’s team clashed, after Wizkid reportedly punched one of Davido’s team members. 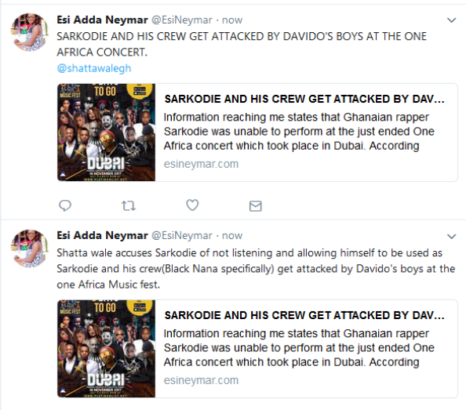 Now FULL Details : There was pandemonium at the One Africa concert which took place in Dubai, as it was gathered that Ghanaian star, Sarkodie was reportedly attacked by Wizkid and Davido’s crew. Information reaching me states that Ghanaian rapper Sarkodie was unable to perform at the just ended One Africa concert which took place in Dubai. According to sources, When Sarkodie was just about hitting the stage, Davido’s guy attacked Black Nana by pushing him to the floor to allow Davido perform. Things turned violent as people received slaps and blows like free Wi-Fi. There has been some police arrests. The main fight was between two of Nigeria’s very own artistes, Wizkid and Davido. 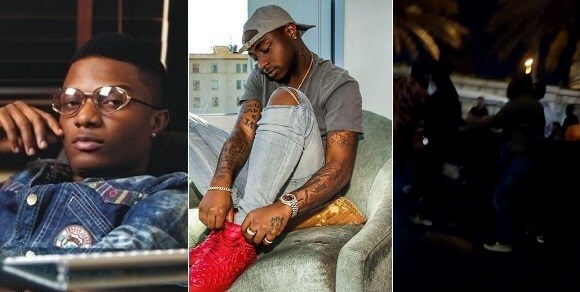 Davido expressed disappointment in the organizers allowing wizkid to perform before him. This obviously didn’t sit well with Wizkid and his people as it led to a big fight backstage. This is coming after they both had altercations on Social Media.. it all started when Davido threw a shade at the starboy and call his award local. Wizkid replied of course….. Davido didn’t stop there, he also said, after his MTV win, that his Afrima awards are already peeling, adding that his MTV Award can never peel. Then, one of Davido’s Team member, his cousin, Clark Adeleke came for the starboy, and claimed the only Hit he’s got is his picture with Nicki Minaj (READ HERE). Apparently, they’ve decided to make it physical.